When selecting a bathtub, it is important to consider not only the space available in your bathroom, but the functionality and desired look you would like to create. Signature Kitchen & Bath designers are experienced with helping to determine the appropriate bathtub to not only match your bathroom decorum, but fit within your available space and cater to your residential or commercial needs. 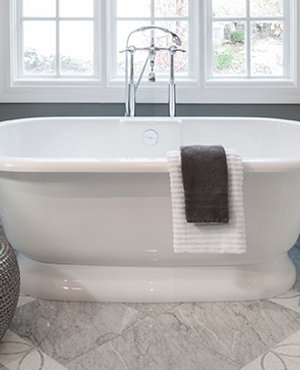 Styles available for your bathtub remodel include: Traditional, Jacuzzi, Drop-in and Pedestal. Our team can also help you navigate through the installation process, determining whether your bathtub will require plumbing assistance or custom edging. Your complete satisfaction with the style and function of your bathtub install is our top priority.